If patterns in clouds are the sky's narrative documentary, then snowflakes are the sky's mystery because of the infinite patterns they assume. Clouds and snowflakes are manifestations of the different phases of water. Snowflakes begin as water vapor in clouds, but they are not frozen raindrops. They are, in their simplest form, hexagonal prisms that can branch and sprout into intricate patterns. Snowflakes come about when the water vapor in clouds condenses directly into ice. How full of the creative genius is the air in which these are generated! I should hardly admire more if real stars fell and lodged on my coat. The pattern a snowflake assumes varies under different conditions. Libbrecht's Snowflake Morphology diagram illustrates how a snowflake's general shape and size is a function of temperature and humidity (supersaturation). "Why snow crystal shapes change so much with temperature remains something of a scientific mystery. The growth depends on exactly how water vapor molecules are incorporated into the growing ice crystal, and the physics behind this is complex and not well understood." Snowflakes participate in a cyclical journey. From water vapor in clouds, snowflakes assume shapes made possible by a vast combinatorial spectrum of conditions. Despite apparent uniqueness, each snowflake follows the same gravity-driven journey to the earth. Snowflakes come to temporary rest on the earth's surface. Eventually a snowflake becomes melt water that joins a river that wends its way to the ocean which, in turn, ascends back to the clouds. One might parallel a snowflake's journey with that of a person's, although perhaps a person's destination is less clear. I wonder if like the snowflake, the human journey has no destination. Perhaps it too is cyclical. I will lose the habit of stars in the heavens, as frozen water loses the habit of snowflakes. I will take my frozen body, and give it to the young goats that they might graze it. 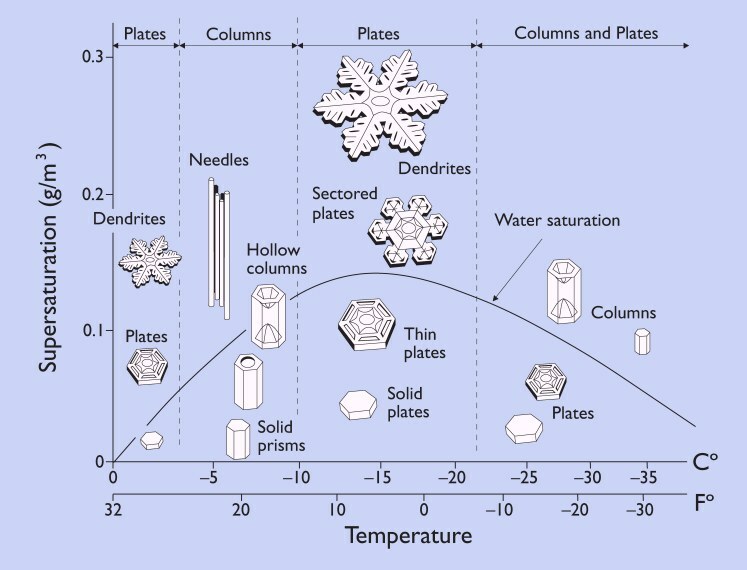 A Snowflake Primer by Kenneth G. Libbrecht, Professor of Physics, Caltech. The Physics of Snow Crystals by Kenneth G. Libbrecht, Professor of Physics, Caltech. Snowflakes, Photographs by Wilson Bentley. The Journal of Henry David Thoreau.